Stephen III (1337 – 26 September 1413), called the Magnificent or the Fop (Stephan der Kneißl), was the Duke of Bavaria-Ingolstadt from 1375. He was the eldest son of Stephen II and Elizabeth of Sicily. His maternal grandparents were Frederick III of Sicily and Eleanor of Anjou. Her parents were Charles II of Naples and Maria Arpad of Hungary. Stephen V was a son of Béla IV of Hungary and Maria Laskarina. Maria Laskarina was a daughter of Theodore I Lascaris and Anna Angelina. Anna was daughter of Eastern Roman Emperor Alexius III and Euphrosyne Doukaina Kamaterina. From 1375 to 1392, Stephen ruled Bavaria with his brothers Frederick and John II. However, in 1392, Bavaria was split into three separate Duchies, now consisting of Bavaria-Landshut, Bavaria-Ingolstadt and Bavaria-Munich. John II partitioned Bavaria as the result of his refusal to finance his brothers' expensive ambitions in the Italian court. After the division of Bavaria, Stephen retained Bavaria-Ingolstadt, although he soon came to regard his share to be inferior to the other two Duchies. From 1395 to 1397, he also jointly held Bavaria-Munich with John II, after an armed conflict between the brothers. After the deaths of both of his brothers, Stephen attempted to extend his Duchy, this time causing conflict with his nephews. In opposition to them, Stephen also supported King Rupert against the Luxemburg. In 1402 Stephen was forced by his nephew Ernest to confine his reign to Bavaria-Ingolstadt. In 1403, he supported the citizens' uprising in Munich, although that failed. His final attempt in 1410 to reconquer Tyrol, which his father had ceded to the Grand Duchy of Habsburg was likewise unsuccessful. Isabeau of Bavaria, married Charles VI, king of France. Second, he was married in Cologne on 16 January 1401 to Elisabeth of Cleves, daughter of Count Adolf III of Cleves. ^ a b c Adams 2010, p. 2. Adams, Tracy (2010). The Life and Afterlife of Isabeau of Bavaria. The Johns Hopkins University Press. Louis I of Orléans was Duke of Orléans from 1392 to his death. He was also, Duke of Touraine (1386–1392), Count of Valois (1386?–1406) Blois (1397–1407), Angoulême (1404–1407), Périgord (1400–1407) and Soissons (1404–07). Bernabò or Barnabò Visconti was an Italian soldier and statesman, who was Lord of Milan. Albert III the Pious of Bavaria-Munich, since 1438 Duke of Bavaria-Munich. He was born in Wolfratshausen to Ernest, Duke of Bavaria and Elisabetta Visconti, daughter of Bernabò Visconti. 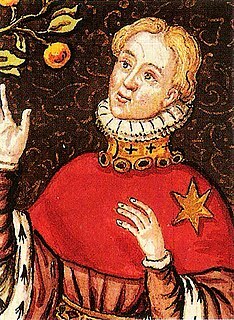 Ernest of Bavaria-Munich, , from 1397 Duke of Bavaria-Munich. Duke Louis VII of Bavaria was Duke of Bavaria-Ingolstadt from 1413 until 1443. He was a son of Stephen III and Taddea Visconti. Henry XVI of Bavaria, , since 1393 Duke of Bavaria-Landshut. He was a son of duke Frederick and his wife Maddalena Visconti, a daughter of Bernabò Visconti. Bavaria-Ingolstadt was a duchy which was part of the Holy Roman Empire from 1392 to 1447. Bavaria-Munich was a duchy that was a constituent state of the Holy Roman Empire from 1392 to 1505. Elisabeth of Bavaria-Landshut, nicknamed "Beautiful Beth", was an Electress of Brandenburg.